When planning a trip to Italy looking at a map of Italy's best attractions and cities is a great way to gain perspective on your travel itinerary. That way, you can make informed decisions about where you want to visit, how long you will need to explore each location, what time of year you want to travel, how you can get around from place to place most effectively, and most importantly what you want out of your trip. Before you start mapping out your itinerary, it's also important to understand that each of Italy's 20 regions is quite different. Regional variations in food, language (dialect), and architecture make a trip to Italy like a trip to 20 little countries all at once. The language spoken in Italy is Italian, but there are some local dialects that can be hard to understand for the casual Italian student. However, English is widely spoken in heavily touristed areas, so you should be able to find someone who can help. If you only learn one word of Italian, let it be this one: sciopero. Pronounced "SHO-per-o" it means "strike." Labor issues in Italy are often pushed into the public consciousness by short strikes, often lasting a day or less. If you see papers hastily posted on the walls or windows of a train or bus station, look for this word. Since they are of short duration, strikes seldom cause too many problems for tourists who are flexible. Italy enjoys a moderate climate. In the south, rain is infrequent in the summer. In alpine regions, quick thunderstorms are frequent, even in summer. At or near sea level the average low temperature seldom dips below freezing. Summer can be dreadfully hot—in August, Italians head to the beach and stay there. As a result, a better time to visit Italy is in the autumn months, when the porcini and truffles start appearing. It can be cool at night and there is more rain than during the summer months, but the temperatures and treats are worth the wetness. Italian festivals and sagras are a great way to see more than the average tourist sees. A Sagra is a celebration of something specific like porcini mushrooms, where residents of nearby towns and cities come together to cook and share recipes featuring this highlighted ingredient. You're likely to find great food served in the open air at the communal tables—a great way to meet Italians. In the summer, Italians eat lunch at around 1 in the afternoon and dinner around 8 in the evening. Lunch (pranzo) is often the main meal, and most stores close at 1 for a long period when many shopkeepers and shoppers alike flood to local restaurants. As a result, you should try to get to restaurants before 1 p.m. to avoid the rush. A small trattoria may not have a wine list, but will always have a house wine (vino della casa). Water is safe to drink, but Italians prefer mineral water (acqua minerale) which is generally cheaper than it is in the United States. It is customary to leave small change for a tip in Italy, or up to five percent of the total bill if the service is good (some say 10 percent in a fancy ristorante where the service is impeccable). When ordering a coffee at a bar it is customary to leave a small coin for the person who makes and serves your coffee. While you're there enjoying the food, don't forget to stay in some of the fantastic accommodations that Italy has to offer; there are usually abundant hotels near train stations—many budgets, a few seedy, and some really great hidden gems. The hotels in Italy are rated by a government system that does not take into account the "charm" of a place. Once you're ready to travel, hope on Italy's extensive rail system or take one of the buses, which sometimes duplicate the rail routes. Many small cities in Italy have access to the larger cities close by through a twice-a-day bus trip, and bus stations are often found near the train station. Trains and buses are subsidized, making Italian transportation slightly cheaper than most of the rest of Europe. Train passes may not offer many advantages over just buying a ticket at the station, especially for short trips. Since local train routes and times are planned so that workers can get to their work destinations cheaply, be aware that there are often fewer trains on weekends and holidays. Meanwhile, bus tickets for local buses can usually be bought at a tabbachi (tobacco store) or sometimes at a newsstand. If you have several long legs planned for your Italian itinerary Italy Rail Pass can indeed save you money. Remember—you need to take longer trips to make a pass worthwhile. Don't use valuable pass days for short trips, save them for legs like Venice to Rome, or Rome to Sicily. Everyone knows the three biggest destinations in Italy—Rome, Venice, and Florence—but one of the biggest mistakes travelers make is to try to see this triumvirate in 10 days. While you can certainly travel to each of them within ten days, you won't really get to experience any of the depth of these diverse and interesting places. If you only have a very short time, take a tour—one that whisks you from place to place efficiently. You don't want to spend your time waiting for trains if you've only a short vacation! The fix is, of course, to ask for more vacation time. Even if you have to take it without pay, it'll cost you less to go once and see more than to go twice but see less each time. It's those fixed costs—the airline tickets and the jet-lagged days lost—that get you in the end. Also, be sure to make the most out of your destinations. While you're in Florence, for instance, you'll want to make your way to other destinations in the Tuscany region like one of its many unique vineyards. To many of us, Rome is a fascination bordering on obsession; it doesn't feel like a trip to Italy unless we've taken our first coffee in the Tazza d' Oro, the "Golden Cup" near the Pantheon. Still, in the summer Rome is hot and humid; there are pickpockets to watch out for; people can be rude—and they can be helpful. Rome's architecture is a jumble of modern, Baroque, Renaissance, and Roman; Rome is a golden mutt with fleas. 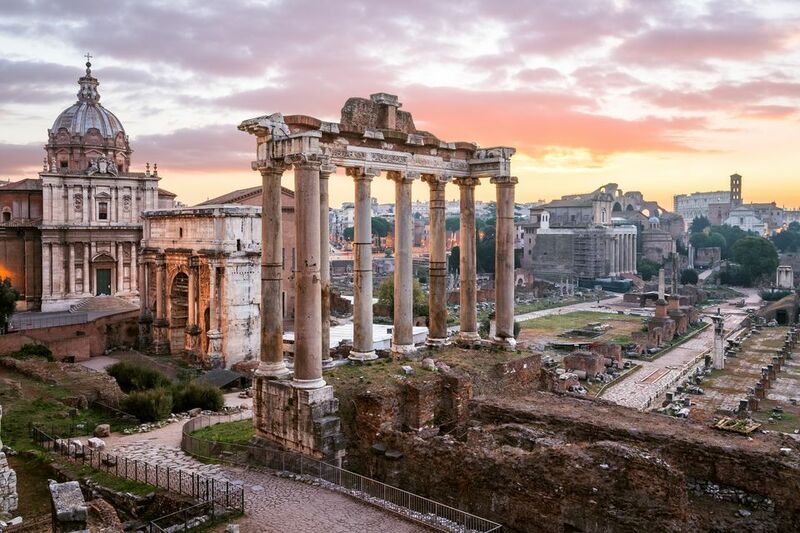 The idea of what is Rome is as fluid as a dream—and that is why we love it. It is not an easy love; it is a love that can become derailed easily. You must walk it. You must take a tour because walking is tiring and the list of things that have happened in Rome over the years is long indeed. If you've never been to Rome you might want to grab a "travel buddy" from Eddie's Fun and let him or her alleviate your fears of the Eternal City. They'll tell you how to get around, where to eat and where to find the things you're interested in. Then, when you're educated in the ways of the crazy Romans, you can travel on your own—it really doesn't take long at all. One day you'll want to have lunch with a view, so head over to the Castel Sant'Angelo, see its interior and learn about the lavish life the Popes led while hiding out, then head up to the top floor for the Caffe and have a cheap meal with a fantastic view. Yes, you can wander or you can follow a three day Rome itinerary. Of course, that doesn't mean you can't stay for a week like we usually do. Don't be afraid of Rome. Fear makes your vision go all funny. It's a great city and there's a bit of sidewalk and a bit of magic for everyone. The Italian traveler shouldn't forget the smaller cities and rural places. The Italian region of Tuscany is popular, but it doesn't consist entirely of Florence and its suburbs—think of Lucca or Sienna, and just a short trip down the train line is Pistoia. The Rural life in Tuscany can also be relished in the Lunigiana, far northern Tuscany near the mountains of Massa and Carrara, where you can tour the marble quarries. You'll save money out there in the sticks where a three-course lunch with wine will only set you back a few Euros at a Lunigiana local favorite restaurant, Spino Fiorito, or you can rent a beautiful and spacious apartment in Gravina in Puglia, right in the cathedral square, for a few euro in the spring before the tourist season really kicks into full effect. You won't see those kinds of prices in Rome! Italy's south is full of rural tourism opportunities—try Puglia, see the Trulli! Each of the regions of Italy has its own charm; you can't go wrong picking one and exploring it. The best way to explore the rural areas of Italy is by renting a vacation house or apartment in a rural area or small Italian city as this will allow you the opportunity to set up a "home base," get to know the neighbors and community, and travel out at leisure to nearby destinations and local favorites.